I’ve been sitting here, staring at my computer screen, willing words to come for almost 30 minutes. I’m supposed to be writing about forgiveness in marriage and life. About how important it is. How essential to healthy relationships. How critical to a growing faith. And, of course, about how to do the whole forgiveness thing. Instead, I find myself wondering if I’m even qualified to write about forgiveness. Yes, I have been married for most of my life – to the same man. Yes, I have been hurt dreadfully and had to walk through the process of forgiveness, not once but multiple times. Not just in marriage, but in life. 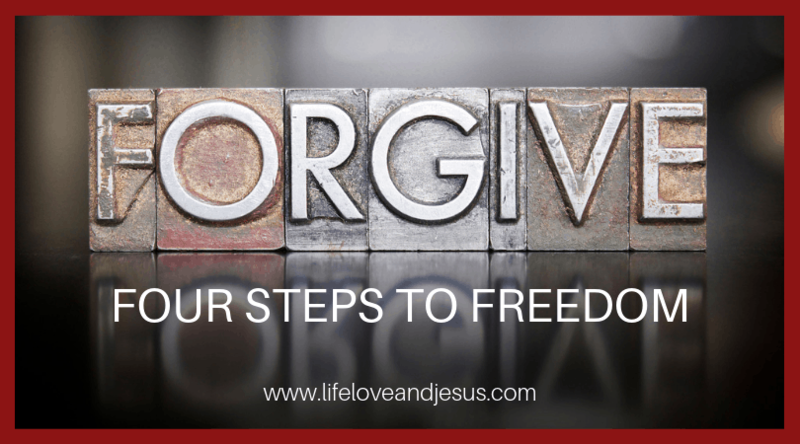 Yes, I’ve experienced the sweet freedom of forgiveness given and received. But still, I wonder. I’ve done the whole forgiveness thing so badly at times. I’ve withheld forgiveness. I’ve allowed myself to grow bitter and despondent. I’ve even tried to use forgiveness as a bribe – ‘do this and I’ll forgive you’ – as if that could be true forgiveness. Still, I’ll try. I’ll share what I’ve learned from Scripture, from experience, and even from failing to forgive. And maybe, as I share, we can learn together as we stumble-step our way through life and relationships that can only, ever, exist and grow in a place of forgiveness. Forgiveness is giving up my right to be offended. My right to demand payback. My right to expect an apology and for the offender to make things right. Forgiveness is giving up my rights and replacing that narrow-minded insistence on vengeance with love. Forgiveness is most of all an act of the will. You don’t feel your way into forgiveness. You choose forgiveness. In spite of the hurt. In spite of the anger. In spite of all the damage done to you and others, you choose to not hold the offender accountable. You choose to let God handle it. Does that mean automatically returning to the way things were before the offense? No. Never. Definitely not! If we do not take steps to correct the situation or the relationship, then we will most likely be hurt again. Let me use my life as an example. My husband and I had a serious argument one day several years ago. At the time, I was working on my master’s degree, and had to go to class and take an important test the next day, which was a Saturday. I was gone for several hours, and when I returned home, Howard had moved out. That’s right – left without even a conversation, a head’s up, an effort at communication. We would be separated for a year. We went to counseling. He filed for divorce. Things were ugly and hard, and I was very, very hurt. When Howard asked to be let back into our family twelve months later, many things had changed. I had graduated with my master’s degree. I was making more money than he was and wasn’t as stressed financially. He had not paid child support. He had made many stupid decisions. I thought long and hard about reconciling. In the end, we worked it out. But that meant more than a year of counseling. It meant many, many changes in our lives and how we related to each other. It meant years of rebuilding trust brick-by-brick. And it meant a lot of forgiveness! Buckets of forgiveness. Oceans of forgiveness. The point is, forgiveness alone wasn’t enough. Change was required. Work was required. Forgiveness doesn’t automatically mean that change and work will be done. Howard could have chosen not to return. I could have chosen not to let him back in. Neither of those choices would have changed the need I had to forgive him. Forgiveness is never for the offender – it is always for the offended. Forgiveness releases the offended one to healing and wholeness. It may not mean reconciliation, as it did in my case. But before we could make progress on restoring our relationship, I needed to heal from the hurt. And the only way to healing was through forgiveness. God has forgiven us more than we can imagine because of His love for us and the death of Christ for our sins, therefore we need to forgive others. Here’s just a sampling of the wonderful truths found in God’s Word. Choose one today to memorize! Before going further, I want to assure you that forgiveness, unless the offense is really insignificantly small, is seldom a one-and-done event. It is a process of repeatedly forgiving the person who offended you. Pain is real, and forgiveness does not make it disappear. Therefore, when the pain of the offense rears its head again and stirs ups those feelings of anger and betrayal and hurt, you need to forgive again. Forgiveness frees you, not from the pain and not from the consequences, but from being stuck in the past and unable to move forward. That said, the process of forgiveness has some non-negotiable, can’t be avoided, must-do steps to take. First, you must acknowledge the pain and the offense. It is so common for women – especially – to say, “It’s no big deal,” and just try to shrug things off. Don’t do that! You are a valuable person, and someone has hurt you. To say, “It’s no big deal,” means your feelings don’t matter – but they do. If the only person who ever hears about your pain is God, that’s OK. Only you know who you can trust with your pain. But at the very least, acknowledge it to God and yourself. Although, honestly, it’s best if you have someone you can talk to as you go through this process. At times in my journey, my way of acknowledging my pain has been to journal. In fact, many times I have turned to journaling. There is something about getting all the pain and anger and hurt out on paper that is helpful. So, pray, journal, talk, cry, scream, eat chocolate (just not too much!). Do whatever is necessary to admit to yourself that your pain is real and valid. Second, take your complaints to the Lord in prayer. This is especially important in marriage and parenting relationships. We tend to want to try to fix our mates and our children when that isn’t our job. God is in the life-changing business, and we need to lean on Him when our relationships hurt. This doesn’t mean say nothing – we’ll get to that soon. But it does mean to make sure that God gets the brunt of your anger and frustration. He can handle all your emotions. Don’t take your frustrations out on those who are powerless to help. I remember clearly one day, when Howard and I were separated, that my oldest son came home from work early (the other son was at baseball) and found me yelling, crying, and throwing things. He was only 17 and didn’t know what to do – so he called my best friend, who came over. The point it – I wasn’t expecting him, and he wasn’t equipped to handle my emotions. I was ‘having it out’ with God, and my son saw some of the pain and ugliness I had tried to protect him from. God is the right person for those raw emotions – and good friends. Not your kids. Not your spouse, especially if he is the cause of the pain. Take it to God. Third, do some soul-searching and dig out your responsibility for the situation. No problem is ever one-sided. It might be 99% the other person’s fault (probably not! ), but you need to admit your 1%. This might take some serious time in prayer, in the Word, talking with faithful friends who will not put up with any smokescreens, or even counseling. Whatever it takes, commit to the hard work. Even if the relationship cannot be salvaged, you can grow through the pain. Be honest with yourself and do the hard work. And while we’re on the subject – don’t forget to forgive yourself for the mistakes you’ve made that contributed to the situation at hand. Nobody’s perfect, including you and me. Fourth, depending on the offense and your circumstances, talk to the offender. This might need to be in a neutral setting such as a counselor’s office or at least in public where blow-ups are less likely. Use caution in deciding whether, when, and what to say. Perhaps the person who offended you isn’t even aware of what they did. You could have two responses to this: deal with it only between you and God because what would be the point of causing pain to another person when what they did was unintentional? Or, discuss the problem with the other person, informing them of how they hurt you and what you would like for them to change so it doesn’t happen again. Or maybe, like my situation, the pain you’re experiencing is the result of long-standing patterns in your relationship that need to be addressed. In such a case, seek professional help so you can talk productively to your partner, not just trade accusations. Of course, if the situation you’re in is in any way dangerous, talking to the offender might best be avoided. Sometimes you need to face reality and avoid relationships that cause you or others (your kids?) harm. It’s a tough call, which is why we all need good friends, a good church, and maybe a good counselor. Finally, make a plan for moving forward. Is the offender going to be a part of your life in the future? Plan for how to restore and rebuild the relationship. Are you done with that relationship? 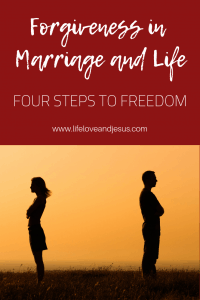 Plan for how to avoid recreating the same mistakes you made in other relationships. Because you made mistakes. Of course you know that. No problem exists in a vacuum, always and only the other person’s fault. Own your own part in the problem and grow from it. Planning for the future after hurt and forgiveness is just as important as any other step. You forgive so you can go forward. What will that future look like? Are you restoring a marriage after an affair? Does that mean moving, changing jobs or churches, or even cutting ties to old friends? Are you moving forward after a painful divorce? Does that mean new friends or leaning harder on old ones? Going back to school to pursue long-delayed dreams? Or maybe taking a much-needed vacation? Only you – with God, friends, and family – can determine what your future will look like. And sometimes it will be a long time coming. After Howard moved back home and we went to more than a year a counseling, things were not all rosy. We had many rough years learning to trust again. We moved. We changed jobs. Our kids graduated from high school and then college. We talked and talked and talked. And now we’re here. Here, enjoying our adult sons, their wives, and our grandchildren. Changing careers – again! (Yes, I think after this school year, I’m really done teaching.) Spending time pursuing long-delayed dreams (writing!) and making more plans for the future. My final encouragement for you – don’t let offenses, hurt, pain, and unforgiveness derail your life. Be strong – only the strong can forgive. Be bold enough to love again. And trust God to turn all the pain into something beautiful. « Where Do I Start Reading the Bible?